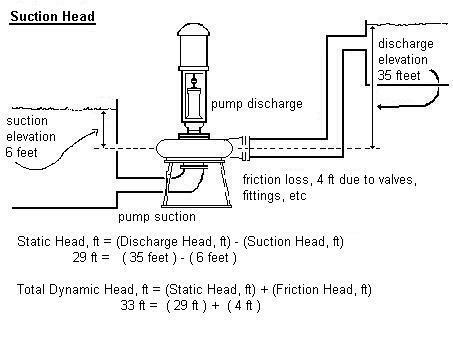 EXAMPLE: The influent pump discharges into a channel where the liquid level is 14 feet above the pump datum line. The pump draws its suction from a wet well, whose water surface is 5 feet above the pump. The friction head is 5.6 ft. Determine the Static Head, in feet. Calculate the Total Dynamic Head (TDH), in feet. PROBLEM: The influent pump discharges into the grit chamber, where the liquid level is 8 feet above the pump datum line. The pump draws its suction from a wet well, whose water surface is 2 feet above the pump. The friction head is estimated at 2.5 ft. PROBLEM: The polymer makeup pump discharges into the solution tank, where the liquid level is 8 feet above the pump datum line. The pump draws its suction from a sump, whose water surface is 2 feet above the pump. The friction head is 1.5 ft. 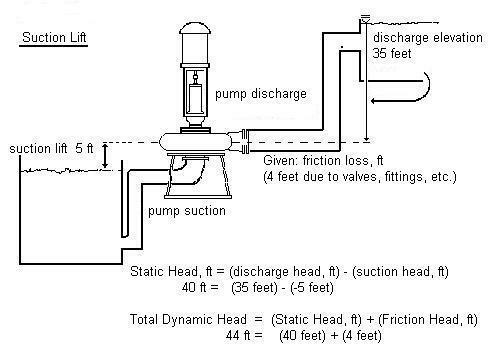 EXAMPLE: The influent pump discharges into a channel where the liquid level is 14 feet above the pump datum line. The pump draws its suction from a wet well, whose water surface is 3 feet BELOW the pump. The friction head is 6 ft. PROBLEM: The influent pump discharges into the grit chamber, where the liquid level is 8 feet above the pump datum line. The pump draws its suction from a wet well, whose water surface is 2 feet below the pump. The friction head is estimated at 2.5 ft. PROBLEM: The raw water pump discharges into the sand trap, where the liquid level is 18 feet above the pump datum line. The pump draws its suction from a sump in the reservoir, whose water surface is 2 feet below the pump. The friction head is estimated at 4 ft.